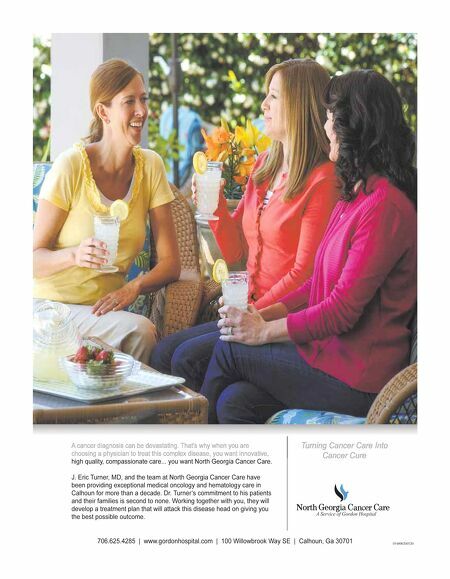 64 The Daily Citizen ◆ HOW TO CHOOSE GUIDE 2015 After a cancer diagnosis, it is important to find a doctor with whom you feel confident and comfortable with. To find a doctor specifically for your type of cancer The doctor who diagnosed your cancer will likely refer you to an oncologist — a doctor who special- izes in treating people with cancer. The oncologist you choose will influence every aspect of your care, so it is important that you feel com- fortable with this person's expertise and approach to your care. He or she will work closely with you, your family, and support staff throughout treatment to provide you with the best care possible. Oncologist practice in different settings, such as hospitals, cancer centers and local offices. To find and oncologist, talk to your primary care doctor, your health insurance company and the local hos- pital. Look for a doctor who treats your specific type of cancer. Depending on your treatment plan, you may need a medical, surgical or radiation oncologist or you may work with more than one type of oncolo- gist. Find out whether the doctor par- ticipates in your health insurance plan. Talk about your choice with family and friends. Pay special attention to people who have received treatment for the same type of cancer. Evaluate the doctor's credentials. Find out whether the doctor received advanced training, and con- firm that he or she is board certified in oncology. Ask how long the doctor has been in practice and how many patients with your type of cancer the doctor treats each year. Ask whether the doctor as access to clinical trials Find out whether the office has support staff, which may include RN, social worker, nutritionist and coun- selor and ask how they are involved in your care. Find out how to reach the doctor during off hours, such as weekends and holidays. 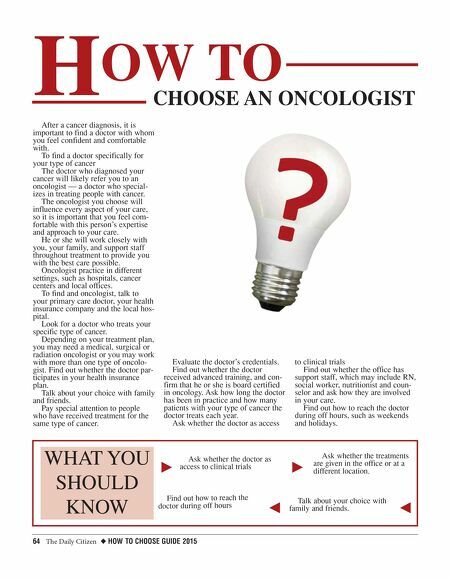 H OW TO CHOOSE AN ONCOLOGIST WHAT YOU SHOULD KNOW k j Ask whether the doctor as access to clinical trials Find out how to reach the doctor during off hours k j Ask whether the treatments are given in the office or at a different location. Talk about your choice with family and friends.